The girls had such a good time during the photoshoot. The photos they took home were a big hit with the kids and the parents. Our professional female photographers took a range of individual and group photos, not forgetting the fun photobooth and green screen photographs!! The photoshoot parties at SE9 Studios are popular with girls celebrating their birthdays. These parties are perfect for girls aged between 7 – 15 years old. The photography studio is easily accessible from Greenwich, Dartford, Bromley, Blackheath, Blackfen and all surrounding South East London and Kent locations. 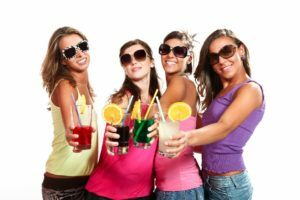 If you are looking for unique, small group, birthday party ideas for girls then get in touch to see how a photoshoot party could be just the solution. For an extra special treat, you can book our make-up artist. Each girl will receive a makeover and professional nail designs, to ensure they look their best ready for the photos. Visit our Photoshoot Party Eltham webpage for more details. Book online or get in touch if you have any questions. Our friendly, professional photographers would love to give your daughter a birthday party to remember. Our fully equipped photography studio is on Eltham High Street, in the London Borough of Greenwich. Whether you are travelling by bus, car or train, SE9 Studios is the perfect place to host your daughters birthday party. We provide everything, so all you need to do is turn up! It’s a no hassle party for you and the kids (and their parents) will love the photographs they get to take home.